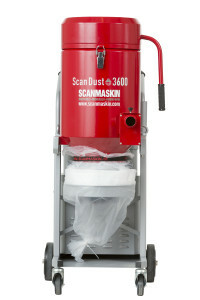 9 June 2017 – Scanmaskin introduces two new Industrial dust collectors, the Scandust 8000 and ScanDust 3600. These two units provide reliability and high performance, and will be a great addition to the Scanmaskin product line. “Our focus has been to increase the number of working hours without interruptions with a sustained level of reliability” Says Martin Persson, Product Manager at Scanmaskin Sweden AB. The new additions to the ScanDust series are two very functional vacuums, with a lot of focus dedicated to ergonomics and usability. The ScanDust 8000 and ScanDust 3600 are safe for the operator and easy to operate. The machines are equipped with Hepa-filters that take care of harmful silica particles. To make it easier, the vacuum cleaners are equipped with a filter indicator that informs the user that it is time to clean the filter. To keep the filters as clean as possible we use the Jet-Pulse cleaning system. The ScanDust 8000 & Scandust 3600 are equipped with a polyester-grade coarse filter package that provides a high degree of material separation, which increases the service life. In addition, the design and filter area of these new models in the ScanDust series are designed to provide the most suction capacity. These models are completely constructed of steel and feature solid non-marking wheels that will never go flat. In addition, both models include locking front wheels which provide an extra safeguard during transportation or when using on uneven surfaces. Both models take advantage of the Longopac bagging system, which makes managing dust very easy and efficient. With the Longopac system you will get 20m/60ft of folded plastic bag which provides about 25 dust free changes. Both the ScanDust 8000 & ScanDust 3600 launches worldwide throughout June 2017. 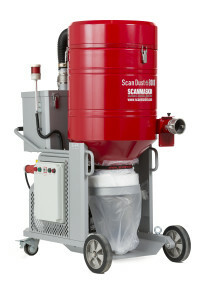 Scanmaskin is a manufacturer of floor grinding and polishing equipment and systems. 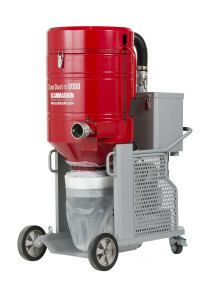 We have a wide range of grinding and polishing machines along dust extractors. The goal of Scanmaskin is to provide high quality products that will provide the end user with reliability and ease of use. At Scanmaskin, we engineer our equipment to work – not to be worked on. We are continually working to improve our product line, and create cost effective solutions for customers. We invite you to try our products and see the difference for yourself. The way we see it, only the best is good enough.